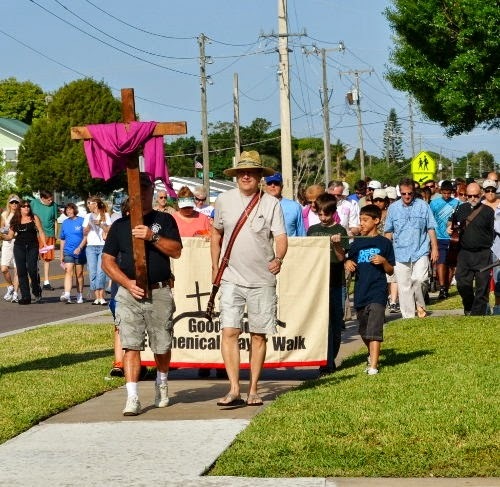 MELBOURNE, Florida -- Everyone is cordially invited to take part in a Good Friday Ecumenical Prayer Walk in solidarity with the poor and suffering of our community and the world. Members of many different Christian faith communities will gather at Our Lady of Lourdes Catholic Church at 9:00 a.m. on Friday, April 18, 2014 for the start of the 1 ½ mile walk. Our Lady of Lourdes is located at Fee and Hickory Avenues across the street from the Melbourne Main Public Library. The route will take walkers back to the church by 11:00 a.m. The devout will follow a Cross and stop to share prayer, Scripture, and song at six sites in the downtown Melbourne area. More than 40 different congregations and community organizations took part in last year’s walk with many co-sponsoring this 6th Annual event. Holy Week begins on Palm Sunday, April 12, 2014, which is the Sunday immediately preceding Easter.